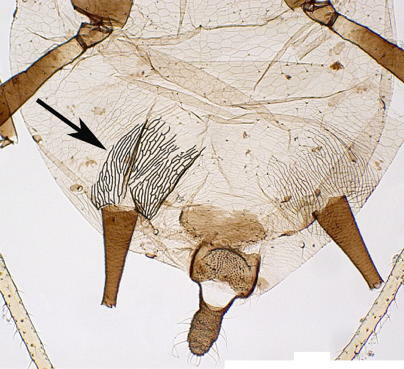 Found principally in Toxoptera, the stridulatory apparatus consists of ridges on the abdomen and pegs on the hind tibia. The aphid produces sound by rubbing the pegs on its legs across the abdominal ridges. Aphis eugeniae exhibits the tibial pegs but not the abdominal striations. The abdominal portion of the stridulatory apparatus consists of striations, or ridges, on the ventral lateral regions of abdominal segments 5 and 6, near the siphunculi. The image here shows the striations, highlighted for clarity. 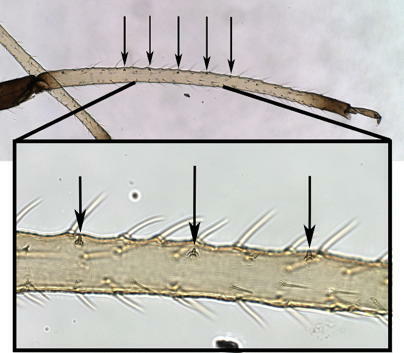 Along most of the length of the hind tibia is a row of spines or peg-like setae. This image highlights the tibial pegs, which are different than the other tibial setae.